Drumming allows you to tap into the layers of the body and mind and studies have shown that repetitive drumming changes the brain wave activity, inducing a state of calm and focussed awareness. It can help to build confidence and relieve anxiety and depression. 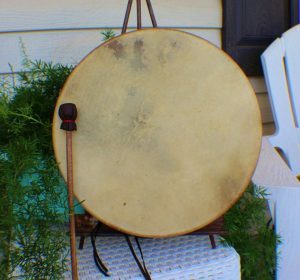 This circle offers a sacred space and community for people with an interest in Reiki Drumming, Shamanic Drumming, Healing and Journeying. Each circle will be guided by spirit and works with the group energy and therefore this may include a Journey, raising of energy for a specific purpose or free style drumming. Previous experience is not required as everyone can beat a drum. Everybody is welcome and please feel free to bring your own drum or rattle (if you have one). I do have some spare drums available (please contact me to reserve one). You are also welcome to come along and sit back, relax and enjoy the energy and sound of the drum to wash over you. Drum Healing is available at the end of the evening, if wished, for a small charity donation. I look forward to connecting with you in the spirit of the drum.